Mt. 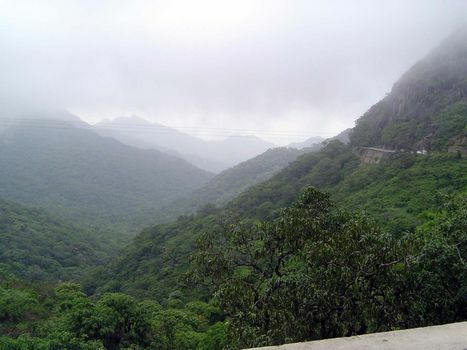 Abu is a detached fragment of the Aravalli Range and--no mere hill--forms a rough plateau perhaps 4 miles by 14, with a crest elevation varying from between 3,500 and 5,500 feet. The Jains built some of their best-known temples here, at Dilwara. A mile to the south, at 3,800 feet, the British created a hill station; in its cemetery lies Honoria Lawrence, Henry's wife. The British liked the place so much that they made Mt. Abu the headquarters of their Rajputana administration. 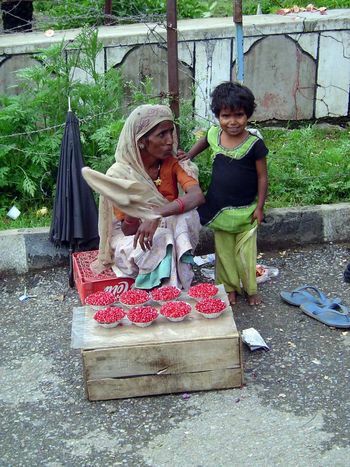 The town remains popular, though like so many in South Asia, it's less charming than the aura around it. 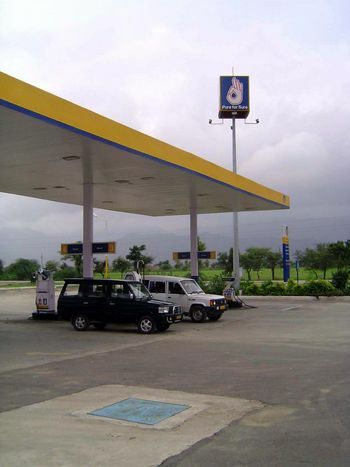 Down at the foot of the mountain: a ridiculous number of filling stations are sprinkled along the national highway. A lot of money has been wasted, but it still says something about the enthusiasm with which Indians are greeting the promise of a new era for India's very tired infrastructure. Climbing up the mountain road. 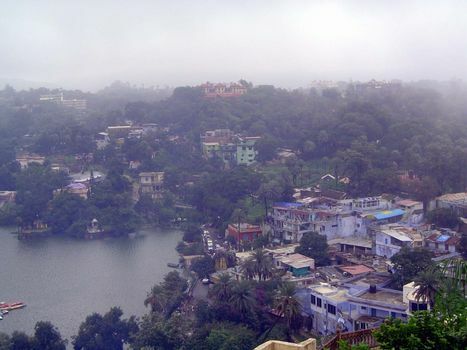 The town is to the right, flanking the small (artificial) Nakki Lake. 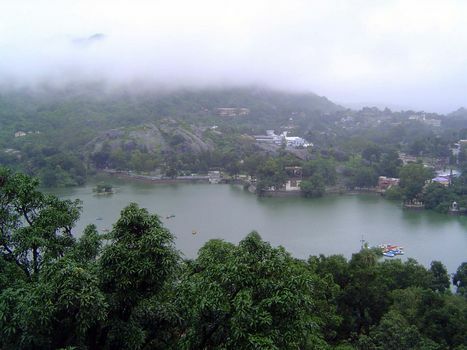 Wherever feasible, the British added such lakes as ornaments to their hill stations. The town itself, however, is best enjoyed from some distance. Princely families built hot-weather retreats here. 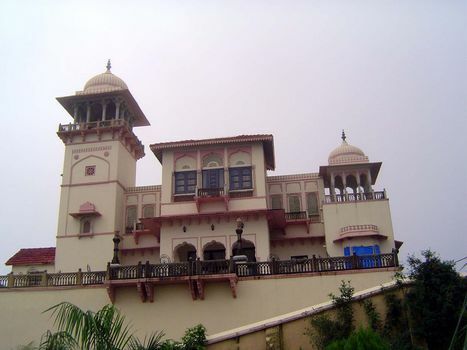 This one, now a hotel, is Jaipur House. 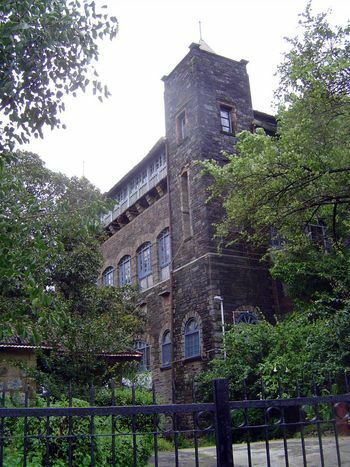 The British had even more massive buildings, like this gloomy pile still belonging to the Survey of India. The Dilwara temples are off-limits to casual photographers. Here at the entrance, however, is some consolation: pomegranate seeds, already shucked.